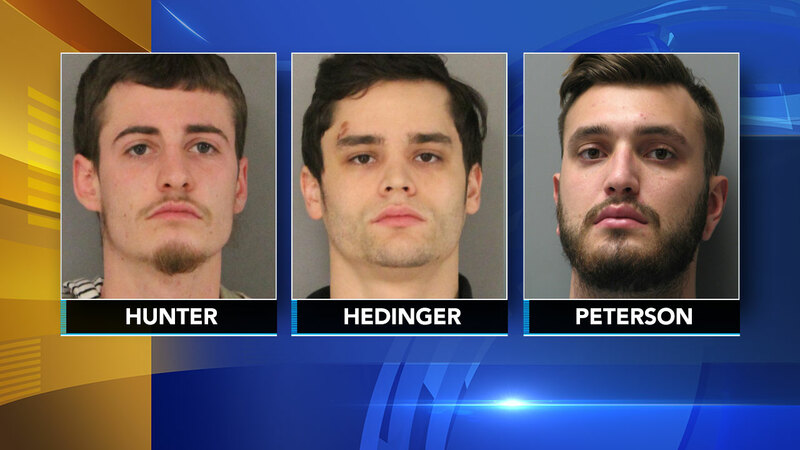 NEWARK (WPVI) -- Three men have been charged in the assault and robbery of a University of Delaware student. Police say the three were caught on surveillance footage Wednesday that showed them digging through the pockets of the unidentified student who had been knocked unconscious. The three then left the scene in Jeep Cherokee that was pulled over for speeding. The driver, 23-year-old Michael Hunter, was charged then on counts including a DUI. Twenty-three-year-old Matthew Peterson and 25-year-old Zachery Hedinger were passengers. Hunter and Hedinger were arrested on charges including first-degree robbery when they tried to get the impounded Jeep. A warrant is out for Peterson's arrest on similar charges. The injured student was taken to a hospital with a head wound.